So, this is what I've been up to lately. I was put in charge of a Super Saturday activity for the Activity Day girls at our church and this is one of the projects we're doing--scripture bags. 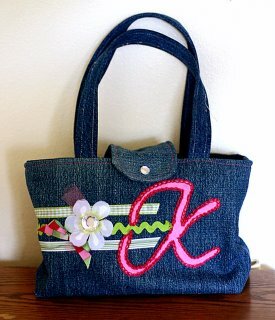 I made it out of old jeans and 1/2 yard fabric and a bunch of things I usually use for scrapbooking. It was so much fun to sew again and I think I might be doing some more of it. I also have a slight obsession with bags. I love tote bags. I love purses. I even like diaper bags. Yeah, I love bags of all kinds and it's so much fun to decorate your own.